← What a Fun Vacation!!! 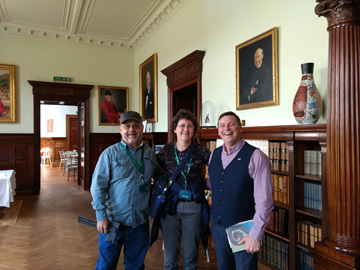 This blog post is a continuation of yesterday’s blog post about our 40th Anniversary trip to England and Ireland. If you haven’t read yesterday’s post, please check it out here! After seeing some of London, we went to Ireland for a week. 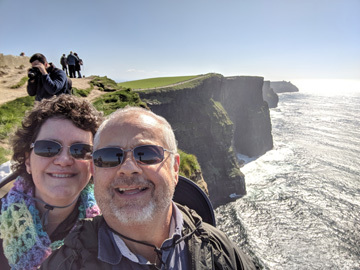 We saw the Cliffs of Moher on a good weather day! Wow! What a sight that was! The cliffs are very high and beautiful! 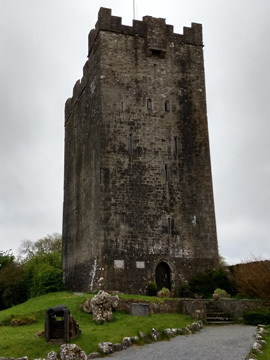 We toured a tower castle called Dysert O’Dea in County Clare. There’s a circular staircase in one corner of the castle that takes you to each floor and room of the castle. That was fascinating! 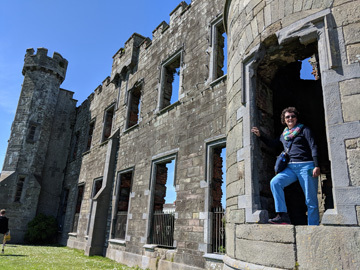 One of the highlights of Ireland for me was visiting the remains of the Ballyheigue Castle that is in my family ancestry! 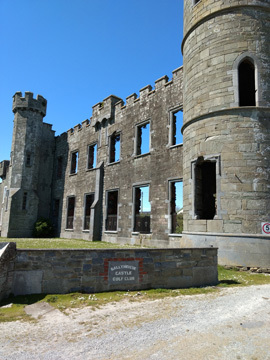 The castle was built in 1295 by Timothy de Cantelupe and held by his descendants, a line of Barons de Ballyheigue, until 1690. Many of my ancestors were born in Ireland and some of them emigrated to Canada in the 1840’s, around the time of the potato famine. What a thrill it was to be there where my ancestors lived many generations ago! What’s a trip to Ireland without seeing the Ring of Kerry? There were so many pretty views there! 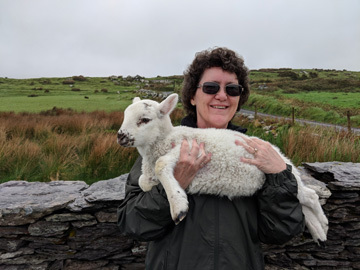 I got to hold a lamb for the first time in my 60 years of life! What a thrill that was! The lamb was so soft! 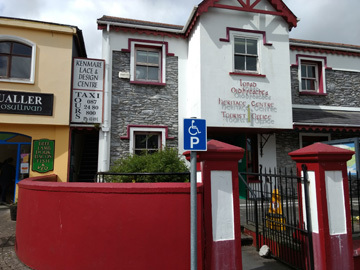 I also visited a lace shop in Kenmare called the Kenmare Lace & Design Centre. 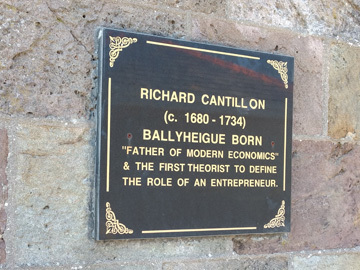 It was on the 2nd floor near the Heritage Centre. 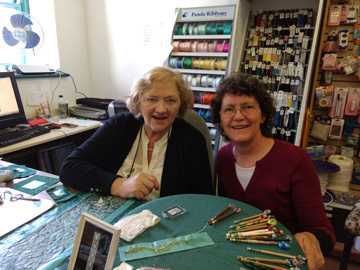 I met Nora Finnegan there, the lady who runs the Lace Centre. She showed me how Kenmare Lace is made. 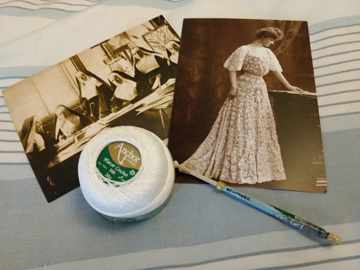 And I bought a few souvenirs from the Lace Centre, too! Unfortunately, I wasn’t able to take photos inside. But take my word for it, the lace was exquisite! 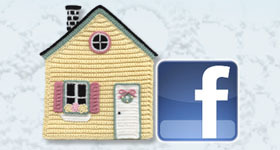 Kenmare lace is a needle lace and the quality of the pieces there was amazing!!! 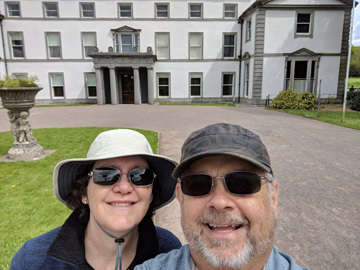 My husband and I toured the Muckross House, a Victorian house built from 1839 to 1843 in Killarney National Park, and walked through the gardens. We also had lunch at their cafeteria. The house and gardens were gorgeous! I LOVE old houses and various types of architecture! The most fascinating story about the house is that the owners, Mr and Mrs Herbert, spent a lot of money to fix up the house and gardens for Queen Victoria’s visit in 1861. The queen only stayed 2 nights in the house! The expense almost bankrupted the Herberts! 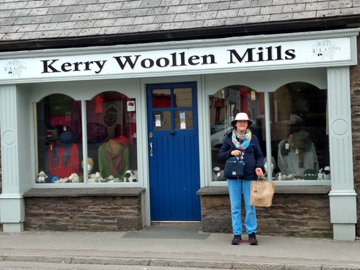 There was a wool shop in County Kerry called Kerry Woollen Mills. I stopped in there and brought home a few souvenirs from that shop! 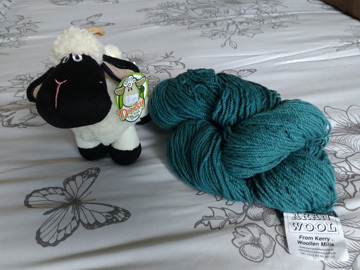 The shop had lots of beautiful finished knit items to buy, but I just bought a hank of wool yarn and a cute sheep! 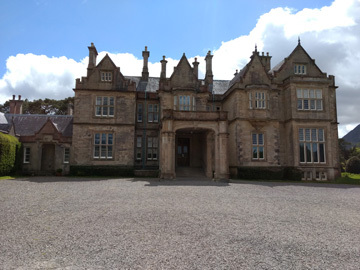 Another old house that we toured was the Fota House. That was an amazing house with gorgeous architectural details inside! The gardens were amazing, too! We had our own tour guide, Brian, who showed us many fascinating things in the house! What a fun tour that was!!! We stayed at Air BnB’s in Ennis, Killarney, Cork, Waterford and Wexford. The BnB in Killarney was exceptional! The host, Adah, was so sweet and helpful! She even put an anniversary card and a box of chocolates in our room! Now that’s a great host! Most of the Bed and Breakfasts met our expectations and most included breakfast, which was wonderful! All in all, it was a fabulous trip! The weather in Ireland was sunny 4 out of 7 days! I guess that’s about average for there. If Arizona got that much rain, I bet we’d have as much green as Ireland! But then Arizona wouldn’t be a desert, would it? Driving on the other side of the road was quite different! My husband drove and I was the co-pilot! Besides being the navigator using Google maps on my hubby’s phone, I got to say things like “you’re getting too close to the curb” or “there’s a rock wall coming up”! Sometimes I just felt like closing my eyes because it’s a little scary on that side of the car, especially when it’s your first time driving (or being the passenger) on the left-hand side of the road! But all in all, my hubby drove great and we survived the other side of the road! By the way, if you didn’t already know, some of the roads in Ireland are only wide enough for 1 car, not 2! Those are the really “thrilling” roads!!! 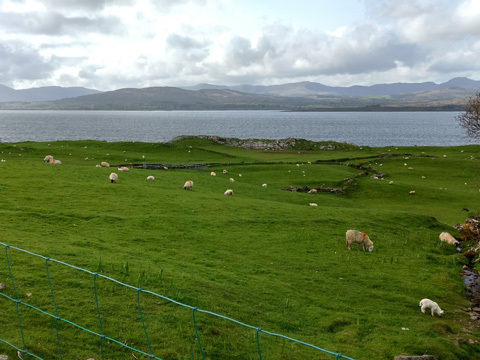 There are fields of sheep everywhere in Ireland and England! Some of the sheep are even colored so if they get out of the field, they can be identified by their color(s) and returned to the proper field. We had such a good time in both England and Ireland. It was a trip we’ll remember with fond memories for many years! I’m so glad that we took the time and spent the money to go on this 40th Anniversary trip! Both countries are beautiful and have so much history to them! And it was wonderful to see both countries where some of my ancestors lived!